If you do a lot of home cooking, you likely rely on your Bosch range a lot. When something goes wrong with it, you have to find cooking alternatives, which can be a hassle considering your busy lifestyle. 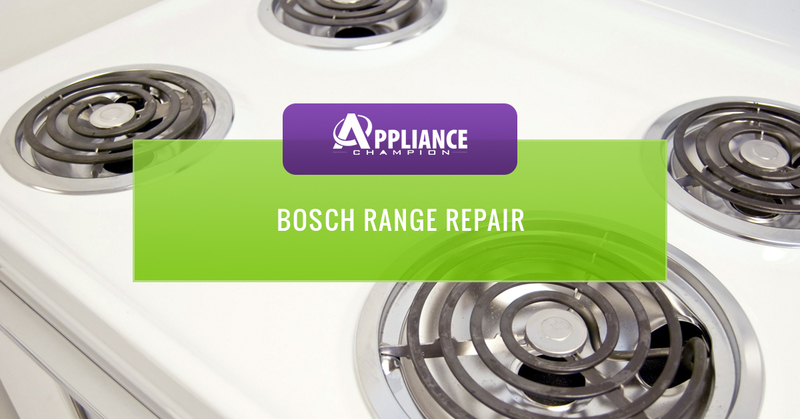 Instead of worrying about how you’re going to fix your range so you can prepare meals again, call on your Dallas-Fort Worth area Bosch range repair professional instead! One thing you have to understand about ranges is they are complicated to fix unless you’re an expert in range repair. You could waste all your valuable time trying to do it yourself, or you could call your local Bosch range repair professional and get the job done in no time. It’s critical to let our licensed appliance repair technicians work on your Bosch range in order to save you time and money, and more importantly, prevent injury. If you notice anything not working quite right with your Bosch range, don’t hesitate to give Appliance Champion a call. We’ll have it repaired in a flash! Appliance Champion offers Bosch range repair and other appliance repair services to the Dallas-Fort Worth area including Watauga, Keller, Southlake, Grapevine, Colleyville, Bedford, North Richland Hills, Arlington, and Saginaw. When you call us, you can count on same-day service by a factory-certified, background-checked, and drug-tested appliance repair specialist. We pride ourselves in offering Bosch range repair and other services that are reliable and build trust with our clients in the Dallas-Fort Worth area, providing them with peace of mind and the knowledge to maintain their appliances. Call us today! If you don’t see your area listed above, contact us! If you are close by we are sure that we can provide the service that you need or may be able to refer you to one of our partners. If you have any questions about your range, be sure to check out our frequently asked questions and read our blog. For more specific questions, you can always contact us or call us. We want to help you have a working appliance that you can rely on.